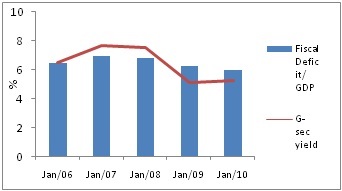 Debt Capital Market In India: The Way Ahead | Business Article | MBA Skool-Study.Learn.Share. The Indian financial system is now at the threshold of a new era with huge changes beckoning in its awake. The liberalization and policy change programme which started back in the early 1990s have almost successfully played their part in converting once a closed economy into a financial behemoth. Quite obviously, the capital market in the country has played its role in this regard. The two important pillars of the Indian capital market are-the equity market and the bond market. While the equity market has expanded in leaps and bounds, the bond market in India has lagged considerably. Boasting one of the largest debt capital market in Asia with market capitalization of 711.1 billion of US dollars, there are still lots of structural defects we encounter as we delve deeper into this market. The debt market in India has almost always been overlooked by the policy makers and the corporates in terms of strengthening its infrastructure and regulatory policies. Although there had been various examples of how a well developed debt market can help an economy stay afloat during times of severe economic crisis (Asian financial crisis, 1997), the policymakers in India seem to be lackadaisical in understanding and implementing the same. One of the most important committee report in this regard, “The Patil Committee Report” has made many important recommendations of which many had been implemented, while many still remains to be enacted upon. The bond market in India is typically classified into three categories viz. the government, the corporate and the financial. Of these three the government bond market constitutes 85%*1 of total DCM followed by the financial (10%*1) and corporate market (5%*1). The issuers of these securities are mostly the central and state government, government agencies, corporate and private sector banks. The investors mostly consist of RBI, banks, individuals, PFs and MFs with the whole system coming under the purview of SEBI, RBI and the Ministry of Corporate affairs. The government bond market, at present is quite established and has almost reached its point of critical mass. However the most under-developed part remains the corporate debt market, where even today more than 95%*7 of the debt being issued are in the form of private placements. Also the non-uniform stamp duty prices and long gestation periods to bring the bond issuances into the market remain other deterrent factors which have retarded the growth in this sector. According to one study in this field, *2[it has been estimated that in India, financial liberalization remains one of the most important control variable, driving approximately 70% of the growth in the debt capital market. Economic development and demographics contribute the other 20% and 10% respectively.] Going forward we do not foresee a huge deviation from this given data provided the fact that the country still remains an emerging economy where much remains to be acted and done upon with regards to financial liberalization and economic development. Among the mature economies, it is the aging population which drives the demand for bonds as the investors look out for more and more pensions and life-insurance schemes. But India, possessing relatively younger demographics (median age of 25*3 today to hover around 27 by 2016*4), cannot sustain on this factor and hence need to concentrate on the other controlling variables. Central projections by the government and various agencies have predicted that a continual gradual reform in this sector will result in a phenomenal progress by 2016. Goldman Sachs has estimated the debt capital market in India to grow to about $1.5*2 trillion by 2016, which is almost twice its present size, or roughly 43% *1of GDP today. This would make a market capitalization of almost 45%*1 of French debt market today, or 15%*1 larger than that of the present UK debt market. The estimate also goes on to say that the most growth would take place in the non-government sector, which would increase by 5.5 times to $575*2 billion by 2016. However, if India goes on to pursue the financial liberalization more aggressively; there are high chances that the bond market will emulate the expected scenario much before 2016. One of the most controversial issue in this regard is the question of fuller capital account convertibility. While some are of the view that opening the Indian resources to world would enable it grow faster through improved participation of FIIs and other foreign investors, few others believe that the Indian economy is yet too young to move up to this challenge. Of course, in India, another important component which will decide the fate of the bond market is the macro-economic condition. The structural reforms which started two decades ago have now rendered a much more favourable macroeconomic condition for India which can be utilized to strengthen the debt market. The economy has been on a growth trajectory now for almost a decade with GDP averaging around 8.5%-9%*5. Of the ground estimates by IMF shows the GDP to hover around the 8% for the next decade or so. This coupled with increased savings & investment, higher productivity growth and rapid urbanization clearly points at a much more favourable economic outlook. The gross domestic savings of the country has remained at a high for the past few years with it touching Rs 2320 billion*6 (RBI) mark recently. This reinforces the huge potential of the market and the need to bring in all this investors. 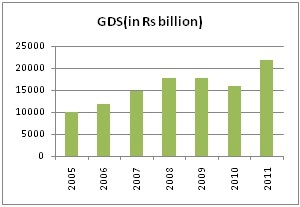 Also the gross fiscal deficit as a percentage of GDP has decreased drastically from 10%*6 of the GDP a decade ago to around 5%*6 in the present times. This has served the purpose of reducing chances of crowding out effect and lowering of interest rates. The public debt, too, has remained within nominal range and has boosted the investor’s sentiment. 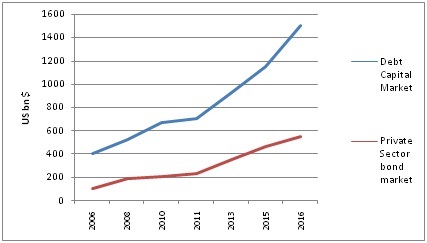 Also, the rise in the net capital inflows driven by rising NRI deposits, FDI and external commercial borrowings have resulted in a strong economic outlook which together with low external debt and huge foreign reserves (more than $300bn) have resulted in a market which is resilient to both external and internal shocks. The actual future of the Indian DCM and it true potential will only be realized if the government, the policy makers and the regulators function in a co-ordinated and prudent manner. With huge inflow of funds required in the coming years for ambitious infrastructure projects and other capital intensive industry, the demand for debt market is ought to increase. Also with India’s increasing connectivity with the outside world and the country’s attractiveness to the FIs, more funds are destined to flow. The technological advancements in other economies along with invention of other exotic instruments, too, will be another deciding factor. In this regard, improvement on market infrastructure and putting appropriate checks and balances in place will become absolutely mandatory. The SEBI, RBI and other regulators till now, however, have performed their job quite well. All in all the future of the market and its potential to realize its capacity will be decided by the course of action to be taken by our policy makers and their willingness to become harbingers of change. This article has been authored by Sudip Kar from TAPMI, Manipal.